Looking for the ultimate workout experience from the comfort of your home? You’ll save thousands on gym memberships plus hours of travel time with the Proflex M8000 Multi-Station Home Gym. Thanks to a clever design, the M8000 offers more than a dozen unique exercises packed into less than 1.5 square metres. The weight stack is fully adjustable with up to 150lbs, so whether you’re a newcomer or a bodybuilder in the making, your workout can be tailored to your needs. The M8000 is constructed from heavy-duty, powder-coated tubular steel that is sure to stand the test of time and features large, non-slip rubber feet that will prevent unwanted movement. Proflex maintain their reputation for quality with high-density cushioning and their choice of soft, sweat-proof materials. The leg, foot, and arm holds thick padding offers support so you feel in complete comfort while you workout. The included cable attachments have rubber handles so you can maintain a firm grip no matter how heavy you chose to lift. 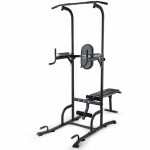 You can use the machine bench press which also converts into a butterfly press for a broader range of motion. You can go straight into a back workout by reaching up for the wide-grip bar and doing some lat pulldowns. Target your middle-back muscles by doing some close-grip cable rows. The comfortable preacher curl pad allows for machine bicep curls, or you can use dumbbells to really isolate each bicep. Standing cable bicep curls allows for an even more explosive movement. Hook your legs onto the leg and foot padding and do some leg extensions for a killer leg workout. Build your shoulder strength with some sets of upright cable rows. Complete your workout with tricep pushdowns for a pump like you’ve never known! 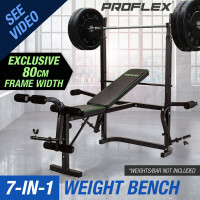 Press, curl and lift your way to the body you've always wanted - Order the Proflex Multi-Station Home Gym today! 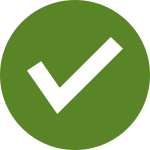 Download the manual for FTNMFGPRFAM85 for detailed instructions on using your product.